To enroll, you will need to create a user ID and password. You will also need your SSC account number and invoice number handy. These can be found on your SSC bill. To sign up click here. 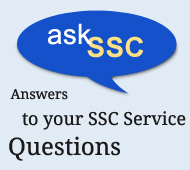 For questions, please contact us at ssc@ssc-inc.com or (360) 734-3490. Our temporary stop service option is available to customers gone one month or more. To arrange this service, contact us at ssc@ssc-inc.com or (360) 734-3490. During the temporary service stoppage, all SSC recycling and garbage containers are removed (at no charge). Once service resumes, containers are re-delivered free of charge. Save paper - sign up for e-statements. Enroll online through our account management system or contact us to sign up ssc@ssc-inc.com or (360) 734-3490. Auto Pay (checking, savings or credit card) and Online Bill Pay also available! 21 Bellwether Way, Suite 404, Bellingham - Office Hours M-F 8AM-5PM. Closed for lunch 12 - 1PM and most major holidays. After hours: Cash or check option only. 1001 Roeder Ave (corner F St & Roeder Ave), Bellingham. Sign up here to pay your bill online. Our Auto Pay Plan is an easy, convenient and environmentally-friendly way to pay your SSC bill via an automatic withdrawal from your checking or savings account. No more checks to write, envelopes to address or postage to pay - a savings of time and money. In addition, you'll be reducing waste and helping conserve valuable natural resources. Using our Auto Pay Plan is easy! Click here to print out an enrollment form or contact us at ssc@ssc-inc.com/ or (360) 734-3490 to request an enrollment form. Complete and sign the form. Keep a copy for your records. Return the completed form to us, along with a VOIDED CHECK OR SAVINGS WITHDRAWAL SLIP from the account you want your collection bill payment taken from. It is important to send either a voided check or savings withdrawal slip and not a deposit slip. Deposit slips do not contain all the necessary bank coding information. Please continue to pay your bill as usual until your statement indicates the amount will be deducted from your bank account. Even though your bill will be paid automatically, you will still receive a statement from us. To sign up for Paperless e-statements click here. Your statement will detail your service information, how much is owed and the date when funds will be withdrawn from your account. There is no charge to use the Auto Payment Plan. If for some reason you want to cancel the Auto Pay Plan, simply notify us in writing thirty (30) days before your account is scheduled to be debited (the due date on your statement). If you want to change the account you use for the Auto Pay Plan, or if you change banks, please contact us as soon as possible or sign up here to manage your account online. If you think an error has occurred on your statement, please contact us immediately to determine if an adjustment to your bill should be made. For questions, please contact us or call (360) 734-3490.